In the last three years 15% of house fires in Herefordshire and Worcestershire were caused by heating appliances, resulting in two deaths and 18 injuries. 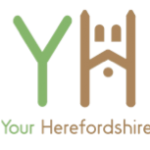 Now the weather is cooler, Hereford & Worcester Fire and Rescue (HWFRS) is encouraging people to check their electrical heating appliances, get their chimneys swept, and get their boilers serviced to avoid winter warming becoming a seasonal tragedy. Group Commander Mick Cadman of HWFRS said: “Portable heating equipment that hasn’t been used since earlier in the year should be checked for broken cabling or exposed wires, and no portable heating appliance should ever be covered or left unattended. 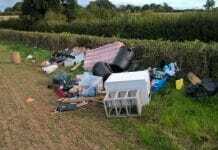 do not store flammable ‘clutter’ near the electrical intake or on top of microwaves. 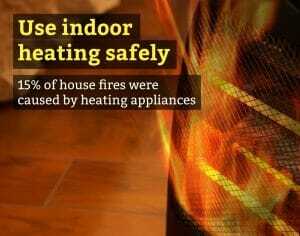 – Make sure that any portable heaters are being used safely. They should not be used to dry or heat clothes and should not be left switched on and unattended. Also watch out for trailing cables that can cause a trip hazard. – Check that electric blankets are in good condition and that manufacturers’ instructions are followed. If a blanket is more than ten years old, consider buying a new one from a retailer that you trust. To arrange a Home Fire Safety Check, contact the HWFRS Community Risk team on 0800 032 1155.